Google AdSense & contextual ads - get paid when your users click an ad to go to another website, driven by contextual relevancy. This is the easiest business model of the four, but is also likely a low earner compared to the potential of some of the other business models. Ad sales - sell ads directly or as part of an ad network. Many sites will make more from direct ad sales than from AdSense, but it is more work managing ad sales. Affiliate programs - get paid a commission when your readers perform an action or buy something from another site. Making a living from affiliate recommendations is hard work because unlike other ad based models you only get paid when one of your visitors actually converts on another site. 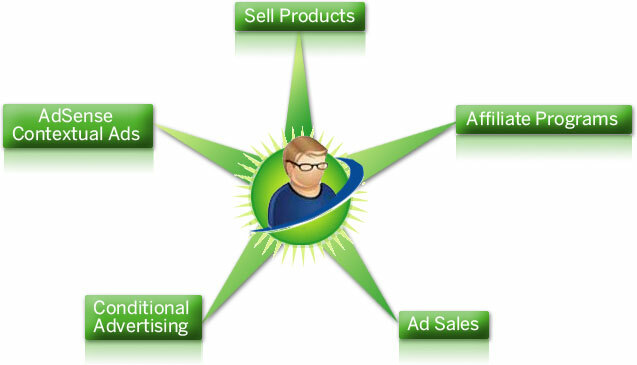 Sell products and/or services - sell services, create indirect revenue streams, or create your own products to sell. This is the hardest business model of the four, but has the greatest potential reward. Conditional Advertising - a somewhat advanced module full of tips you can use when thinking about how you scale your website for maximum growth and monetization. As the line between ads and content blur, web users will get better at tuning out ads. For longterm sustainability you are best of putting yourself as high on the value chain as you can. For most influential publishers that will mean selling ads direct or creating your own product, instead of relying on a third party network. Who your target audience is? What do you intend to sell to them? What will make your business idea unique? You can still make significant profits without being sure what you want to sell if you can solve large problems and make life easier for a group of targeted people. At any level, you still have to know your goals and the reasons why you are creating a site. What makes your site different than the millions of sites already published? My first few sites failed because they had no functional business models. They added little value to the web. That is not to say that I didn’t learn from them, because I did, but they led me to creating this one. If you are uncertain of yourself, don’t be afraid to create multiple channels just to try them out. If you know you want to do something for the long run, you may want to spend a bit of time watching the marketplace before pouring too much effort into making a huge site that is hard to update. Many sites fail because they fill their site with ads on before they get a loyal following. By creating value without placing much emphasis on early profits, you can later make a larger sum of money when the site has a large, valuable user base. Links have value. You need to gain link authority for search engines to trust you. You will never build a large, profitable audience via SEO unless you create content other people will want to link at, and market it aggressively enough to build your brand and build mindshare. Even if you are only trying to sell your opinion, you can still earn money from it through hard work, creativity, or simple outspokenness. If you are selling advertising space, you first need to win great distribution. You do not win that distribution by throwing too many ads up too early! Offer something worthwhile, then try to extract value (in that order). I made a personal blog about losing weight that was accepted into DMOZ and the Yahoo! Directory for free within its first month of existence. After the site aged and gained authority, I placed ads on it. I gave the site to my mom and she has added weight loss calculators and other features to the site to make it more useful. As she keeps adding valuable features to it eventually the site will hit a tipping point where the income increases logarithmically. It is easier to get links for a non-commercial site than for a commercial site. After the links are in place, you can use that link popularity and authority to do whatever you want to do with it. Some people may consider it bait-and-switch, but as long as your site does not deviate too far from its original purpose, most of the links will likely stay. As proof of this point, after I moved a site most people would not link to the new location. They were unresponsive, and those links were stuck like concrete.